The countdown to #1 is progressing. The teams below will be fighting for renewal, spots in the top 15 or even top 10. Coach Bosworth's outlook: This group of guys is very focused on becoming the best team they can be. The team has had a very solid couple of weeks of training and will continue to build as the summer rolls on. We took our annual camping trip already where team goals were set. As always, we will look to be at our best when it counts. We will have some new additions to our varsity squad, so it could take a few meets to start to gel. Coaches thoughts on the team: Our expectation again is to win the conference meet, and get a berth down-state through our extremely LOADED Sectional. Our second goal is to have a very successful Fr/So campaign. 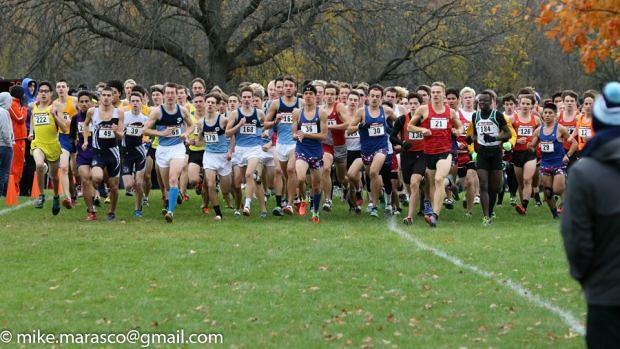 Our young guys looked up to DGN last year and make a commitment to the 24-second scoring differential they achieved at the NXN race in 2017- they were at 38 seconds. This year we just want to have fun and continue to work towards our culture within the City of Chicago. And to make it a better running community. Carson's outlook: The Dolphins are coming into this season in somewhat of good shape. They may have lost their All-American runner, Clayton Mendez, to graduation, but they do have returning all-stater Charlie Nevins back on the scene. Nevins had a tremendous season on the grass last year, but the same cannot be said about his season on the oval as he didn't run amazing times. Nevins is not the only hopeful runner that Whitney Young is looking to have a bounce-back season as Sam Rivera did not have an amazing xc season due to injury last year. Rivera for sure had a great track season running 4:13 in the 1600m at Distance Night in Palatine, but can that success translate to success on the trails? Coach Crowe's outlook: Our team will be led by Christian (returning state qualifier in XC and 1600) and will have a solid pack that needs to stay within 30 seconds for our 1-5 split. Our 6 and 7 need to work to keep within 45 seconds of our #1 runner for our team to accomplish our goals. We are currently having a nice summer of training and looking to develop our varsity depth with our younger runners. Once again, we will need to develop depth in order to accomplish our team goals for 2018. The New Trier Boy's Cross Country team had a strong summer and our strength this season will be depth and pack running. For the first time since I have been coaching, we do not have a clear leader and therefore our success will depend on our pack's ability to keep our 1 - 5 split to 20 seconds and finish in the top 20% of all races. If we can accomplish this, then defending our CSL Conference Championship and returning to state are realistic goals. Our senior class has had their best summer ever. They are a special group of guys that started their New Trier distance career with no running background and only two athletes barely breaking six minutes on their second day of practice. They have come a long way since then and they will be the backbone and heart of our team. Athletes that should be in our top 7 include Ford Baker, Charlie Forbes, Joey Galindo, and Graeme Lane. Other seniors in contention for a spot are Cameron Chang, Tom Rudrud, and Luke Wisner. We have 4 very talented juniors all of which could make our Top 7 by year-end. They include Tyler Ackerman, Ben Akason, Jackson Flick, and JD Shelly. Our sophomore class has depth and talent with Charlie Siebert and Conor O'Neil leading the way, and it is possible that one or both of these two sophomores could be in our varsity lineup by the conference meet. Finally, for the first time in our program's history, we have two freshmen that could crack our Top 7. Both Nick Falk and Patrick Jamieson come in with great running credentials and both have the maturity, patience, and work ethic to be great Trevian distance runners for many years to come. As always, I am excited for the 2018 season to start. We have 3 senior athletes with state meet experience and the potential to improve significantly as the season progresses. It should be a fun season and we could surprise some people by the time sectionals and state roll around! Coach's thoughts on the team: We've got a great group of young men. As a team, they've enjoyed success at the f/s level and were also able to get a good amount of experience at the Varsity level last season. The group is looking to build on that experience and turn that into success at the varsity level at the SPC meet and on that State stage. Coach Root's outlook: Last year we had decent success with a relatively inexperienced Varsity squad. We lost our top runner, 9th in the state Nick Laning, but return five from our state lineup who are being pushed by an extensive list of extremely determined seniors as well as a talented younger group. Coach McLeland's outlook: First is the great culture set by Coach Klatt and (track) Coach Thorpe, assistant coaches Surtz and Weberg and the seniors on the team. Second, last year was not the finish to the season that the team wanted so they have been working in the summer to have a different outcome. Third. The focus is on staying healthy and getting better. If that happens, we should be in Peoria again this season. Coach Sipple's outlook: Well, this year we have a lot of opportunities for several guys to fill roles that were left vacant by an incredible group that graduated. Last year's group will be missed but the lasting impression they were left on our returners is evident already. We have a hungry group that longs to put their own stamp on the tradition that is DGN XC. As a coaching staff really enjoy the new challenges that each new season brings for our team because it really is awesome to witness the transformations with our athletes and watch them grow as people to fill new roles on the team. This is going to be a really fun season! Coach Patrylak's outlook: Last year looked to be a great year for the Tigers, but injuries to two of our top six runners were too much for us to recover from. The boys know that 1-4, this may be the best Edwardsville Team we have put together, but the key to the season is how we progress at 5,6, and 7. Todd Baxter is coming off an injury in track that wiped out his entire track season, but he looks strong and may be the one to make the difference. At Mud Mountain, many of our boys ran course PRs: Prenzler (18 seconds), Pifer (50 seconds), Hartmann (15 seconds), and Zach Walters (who was injured last year) went 16:59 (which would have placed him 6th at last year's Edwardsville Invitational). If we can stay away from the injury bug and close our 4-5 gap by the end of the year, this team has the ability and potential to improve upon our 20th place finish last year.